The paralytic at the pool is one of the more unusual miracles of Jesus. In most miracles of healing someone comes to Jesus with a request. The Centurion sent to Jesus on behalf of his servant and the leaders of the Jewish community supported the Centurion’s request due to his kindness to them. Jairus, a synagogue leader, humbled himself to come to Jesus openly, begging for his daughter to be healed. Along the way to Jairus’s daughter, the woman with the issue of blood braved the crushing crowd, to touch Jesus. But in the case of the paralytic, Jesus seems to initiate everything. Jesus sees the man. He discovers how long he has been there. He singles him out. He questions him. He heals him. Another common element of other miracles is a moment in which Jesus comments on the person’s faith. That is absent in this account as well. The paralyzed man’s faith is questionable—perhaps so weak that only Jesus could see it. Sometimes, a miracle is the beginning of a journey of faith instead of the end. Perhaps the reason Jesus told the man to pick up his mat and walk, was so that he would not be able to come back to the same spot in which he had been lying for years. In the case of the paralyzed man, Jesus isn’t done with him after he is healed. Jesus once more seeks him out. Jesus finds him in the Temple—a place the man was forbidden to go before being healed. There Jesus calls him to repentance and warns him that there are worse things than being paralyzed by a pool for 38 years. Jesus has more for this man then simply taking up his mat and walking. He has more for us too. Jesus sought us out when we were paralyzed and deformed by sin. Though our faith might have been so small only he could detect it, he healed us, granting us access to God at the Temple. But he isn’t done with us after this miracle. He still seeks us out. To warn us, to call us to continued repentance, to transform our lives. Jesus isn’t done with us after the miracle of our salvation. When we take up our mat and walk, we are just beginning to follow him in faith. Pick up your mat and walk. 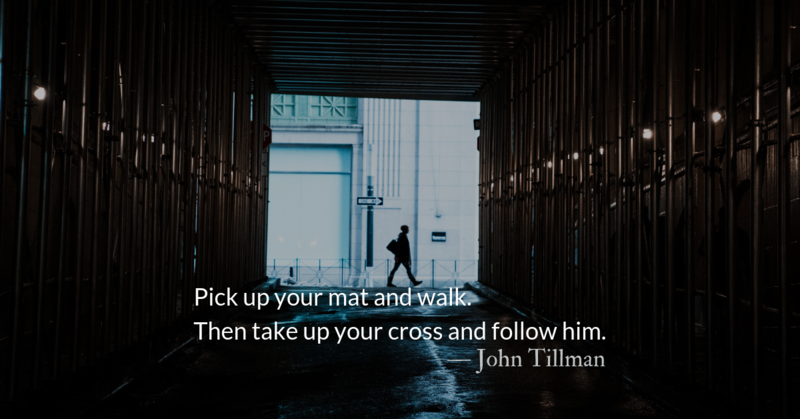 Then take up your cross and follow him. Christ’s miracles weren’t entertainment for a crowd or party tricks to show he was a neat prophet. With each miracle Christ demonstrated that restoration beyond what our world is capable of producing will one day come through his reign. Jesus had food that the disciples knew nothing about. Do we know about it today? Do we know the sustaining power of doing the will of God? “Fasting reminds us that we are sustained “by every word that proceeds from the mouth of God” (Matt 4.4). Food does not sustain us; God sustains us. In Christ, ‘All things hold together” (Col 1.17) Therefore, in experiences of fasting we are not so much abstaining from food as we are feasting on the word of God. Fasting is feasting! When the disciples brought lunch to Jesus, assuming that he would be starving, he declared, “I have food to eat of which you do not know…My food is to do the will of him who sent me, and to accomplish his work.’ (John 4.32-34) This was not a clever metaphor, but a genuine reality. Jesus was, in fact being nourished and sustained by the power of God. That is the reason for his counsel on fasting in Matthew 6. We are told not to act miserable when fasting because, in point of fact, we are not miserable. We are feeding on God and, just like the Israelites who were sustained in the wilderness by the miraculous manna from Heaven, so we are sustained by the word of God. Fasting is not a punishment, a penance, or a weight of duty to wear around our necks. Fasting is cutting off the weights our broken world hangs on our balloon so that we remember to rise, filled with the Holy Spirit. Fasting is washing off the caked-on sludge of the world’s oil spill, so that we can once again soar on wings as eagles. Fasting is not entering a cave of somber darkness, but exiting a darkened cave into joy. 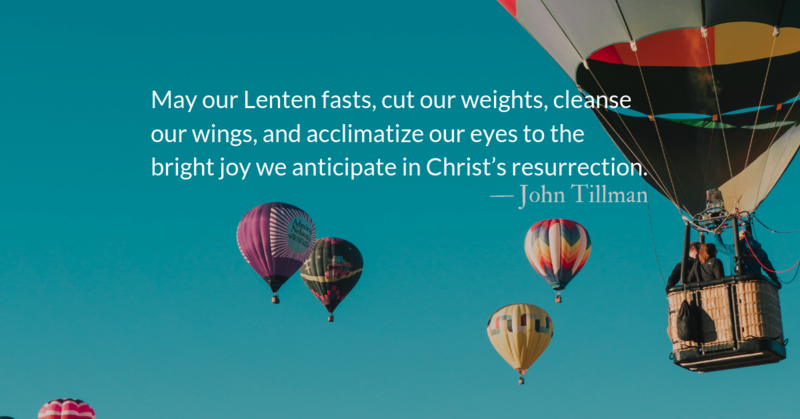 May our Lenten fasts, cut our weights, cleanse our wings, and acclimatize our eyes to the bright joy we anticipate in Christ’s resurrection. As we observe Lent by abstaining, may we maintain a more constant connection and relationship to God through Scripture, prayer and meditation. May more frequent times of worship be feasts for our mind, our heart, and our souls. Read more about Do We Know Him? The woman went into town and brought out to Jesus the food he wanted—a harvest of souls ready to receive the gospel. We are one week into Lent. One way of picturing the observance of Lent is as if one is passing through a desert on a spiritual quest. How is your wilderness experience so far? 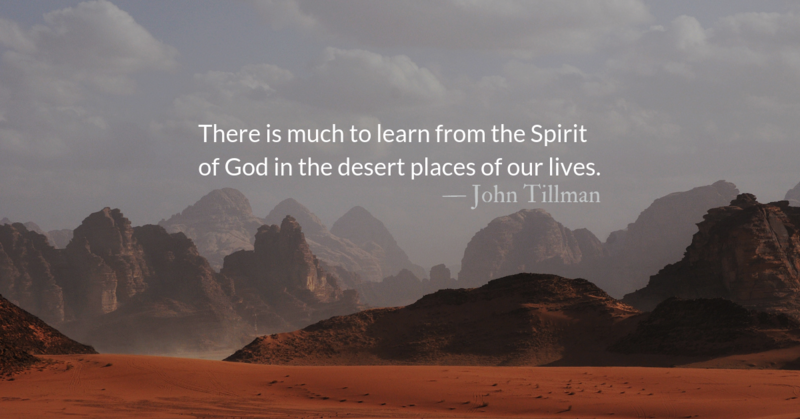 There is much to learn from the Spirit of God in the desert places of our lives. Today we take some passages from our readings in Exodus and in John to pray about how we can meet with God in the desert as the elders of Israel did. Like Israel, we desert what has enslaved us. We come to a desert place to meet with you. Israel came to a mountain, forbidden and foreboding, only a few could see your face. [They] went up and saw the God of Israel…But God did not raise his hand against these leaders of the Israelites; they saw God, and they ate and drank. But now, Christ extends his hand, inviting us to a joy-filled city, in which the God of creation waits to dine with us. In Lent, Lord, we have the opportunity to leave behind worldly things we cling to, to partake of your presence and the heavenly food and drink that is doing the will of God. If we cling to the things of earth, which are like dust, we cannot help but walk with our head down—looking down at what we can hold. Watching them crumble to dust. 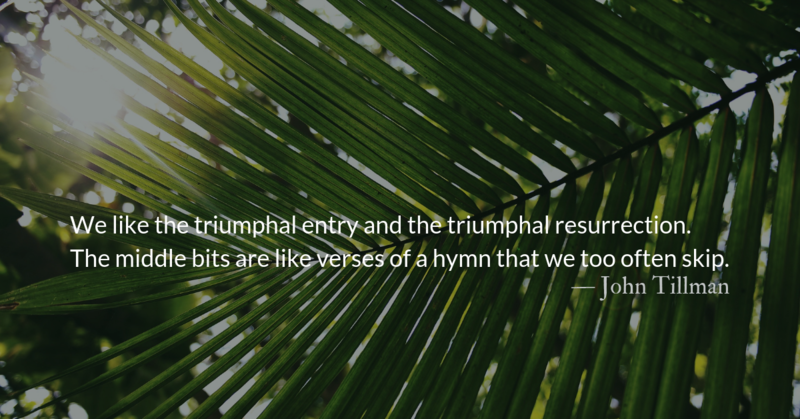 In Lent, remind us that we are born again and raise our eyes to heavenly things. “Very truly I tell you, no one can see the kingdom of God unless they are born again. Oh, Lord, let your Holy Spirit refresh our eyes to see what you see. Let your Holy Spirit tell us of heavenly things and prepare us to understand them. May we lift you up, to draw those around us to you. 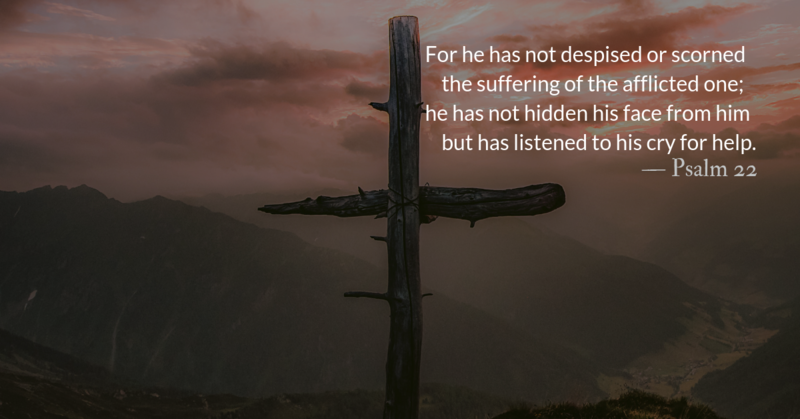 He came to me in the wilderness of my own destitution. He came to me in the poverty of my own understanding. By Christ’s mercy we can resist Satan and he will flee. But just as when Satan left Jesus in the wilderness, he is only waiting for an opportune time to return. Reflection: Where is the Love? John’s account of the cleansing of the Temple is the most violent, showing Jesus making a weapon and wielding it. It’s probably why we don’t read it as often. It’s unsettling to see Jesus this way. Jesus, the tender shepherd, whip in hand, panics the flocks and scatters them in chaos. Jesus the gentle carpenter, builder of tables and furniture, is kicking them over. The detail of making the whip is important. Because Jesus takes the time to make a weapon we know he isn’t losing his temper or acting in rage. It is premeditated. He chose this fight and prepared for it. In my acting work I have often used a script analysis technique from Michael Shurtleff’s book Audition, in which one looks for the love in every scene. Even scenes of violence and tumult are better understood once you find the love and understand what the characters are fighting for. The testimony of the disciples tells us there is zeal, passion, love. But it is still hard for us to find amidst the chaos. Where is the love in this scene? Who does Jesus love? Who or what is he fighting for? We find a clue when Jesus answers the religious authorities’ challenge by predicting his own death and resurrection. How does his death and resurrection relate to the love in the scene? For whom is he dying and how is it connected to the Temple cleansing? The Temple represented God’s connection, his relationship, with the people of Israel. If Jesus was fighting for you to be able to reach him, what obstacle would he have to kick over? What have you placed in the way? In this same chapter, John tells us that Jesus knows people. He knows we are as untrustworthy as the religious leaders in this scene, yet, he sacrifices for us. He knows we will mess up the Temple, our relationship with him, again and again, but he will just keep coming back to fight for us. Why? Because of His passion. Because of His zeal. Because of His love for us. 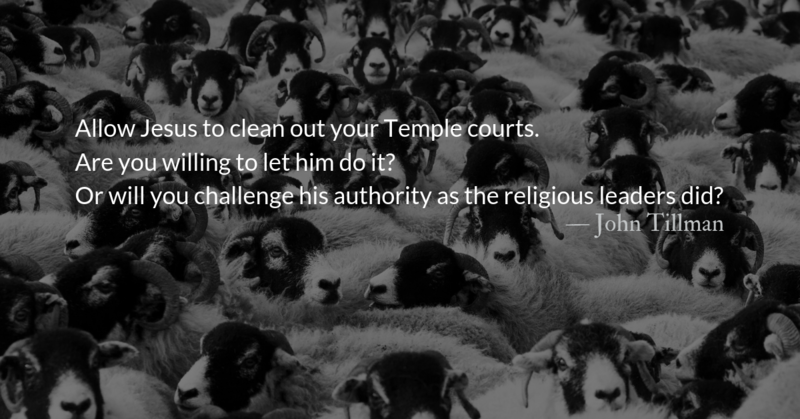 During this Lenten season, allow Jesus to clean out your Temple courts. Ask Jesus what needs to change so that you can better connect with God. Are you willing to let him do it? Or will you challenge his authority as the religious leaders did? Thank Jesus for caring enough about you to keep kicking over your tables and cleaning up your mess. Many scholars believe that Jesus cleansed the temple of buyers and sellers repeatedly—every time he visited Jerusalem. Perhaps the temple Ezekiel sees is the same one Christ told the Pharisees could be destroyed and rebuilt in three days…Christ himself is our temple. Much of John’s gospel is concerned with unity. 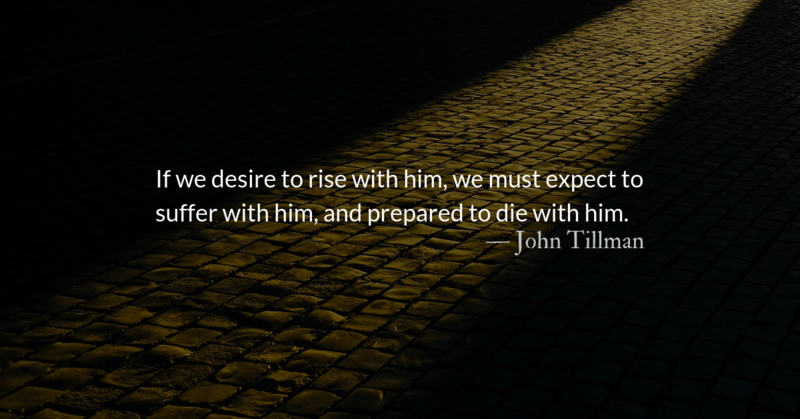 John holds a unity of purpose—that we may believe in the name of Jesus and have life in him. John describes the unity of the trinity—describing the interplay and relationship between the Father, the Son, and the Holy Spirit. 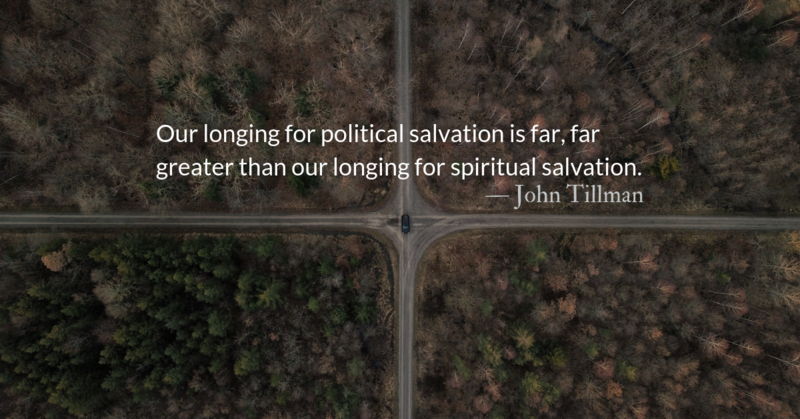 John also spends a large percentage of his writing (most of chapters 12-17) detailing the struggle Jesus underwent in the final hours before his arrest to prepare the disciples and bring them to unity. Unity cannot be achieved by defeating others but by embracing them. 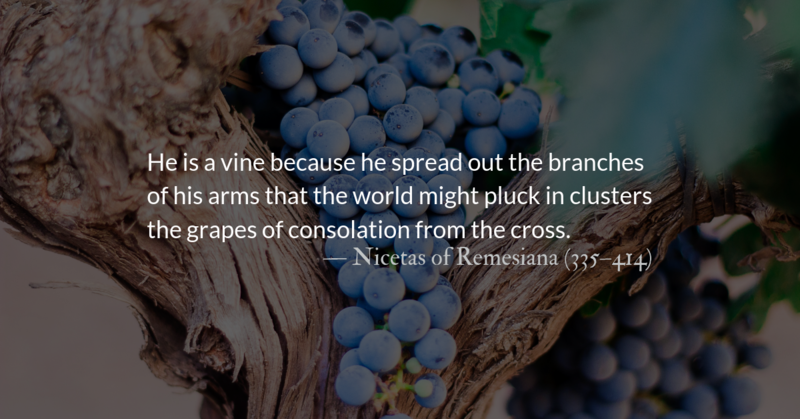 Unity does not come by our cleverness, but by by foolishly clinging solely to Christ and his cross. Lord, our God and Father, in Jesus Christ we pray. We are impressed by your power, by your greatness, by your excellence. Your praises are heard in a multitude of languages which we cannot understand. But you hear all of them. 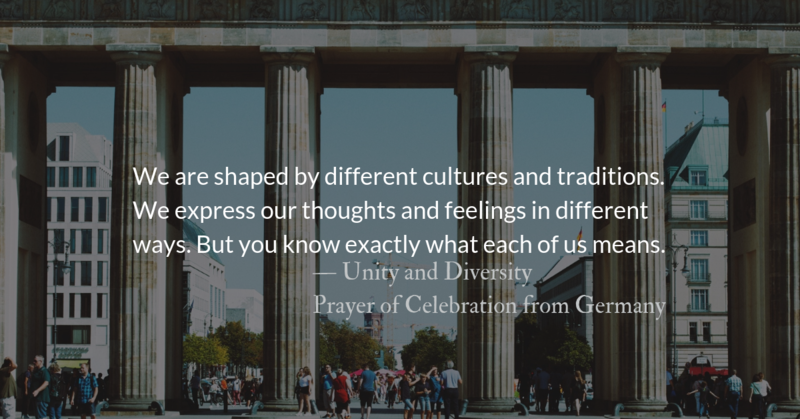 We are shaped by different cultures and traditions. We express our thoughts and feelings in different ways. But you know exactly what each of us means. You rejoice in the diversity which is your creation; you show your affection to each one of us according to our special needs. Send your Holy Spirit to untangle your perplexity so that we can accept brothers and sisters whose expression of faith is different, because you created all of us in your own image. Lord, creator of the universe, how amazing you are. We adore you; we exalt you. What are we waiting for? “Whoever lives in love lives in God, and God in them.” “Love in his name,” is both what we receive and what we must do. Don’t downplay any creative acts he may inspire you to undertake. The humbler they seem the greater impact they may have for the kingdom of God. Create a meal for guests. Create a shelter for birds out of broken fence planks. Create a garden in a barren spot of earth. Create space in your community for the outcast and the rejected.